Scary and intrusive thoughts are a common symptom of postpartum depression. Intrusive thoughts lead many women to believe that they are terrible people, unfit mothers or a danger to their children. While many women experience them in some form, they don’t always recognize that they are intrusive or involuntary. Instead, they believe that the thoughts are how they truly feel, or what they are thinking subconsciously. They don’t talk about them for fear of what others will think of them. It’s important to speak up about intrusive thoughts, but before a woman can do that – she needs to understand what they are, where they come from and what they mean. This is the only way she will be able to accept that the thoughts she is having are not who she has become, but rather, a side effect of her mental illness. Intrusive thoughts are an idea or image that come to your mind involuntarily. The thoughts may be extremely out-of-character and can be shocking when they happen. They are almost exactly the same as the thoughts and images that you normally have, except that they are not created nor welcomed by you. Intrusive thoughts are a sign of mental illness and prove that your mind is playing tricks on you. What are NOT Intrusive Thoughts? They are not third party voices in your head. They are not an indication of postpartum psychosis. They are not subconscious thoughts or images. They are not part of your normal train of thought. They are not how you truly feel deep down inside. The most common type of intrusive thoughts or images are of doing something bad to the baby. They can be “what if…” type of thoughts such as “what if I drop my baby down the stairs” or “what if I stab my baby with a knife.” They can also be images such as watching the baby drown in the bathtub or crashing the car with the baby in the backseat. Intrusive thoughts can also be about harming yourself. Many women experience suicidal thoughts but have no actual desire to commit suicide. 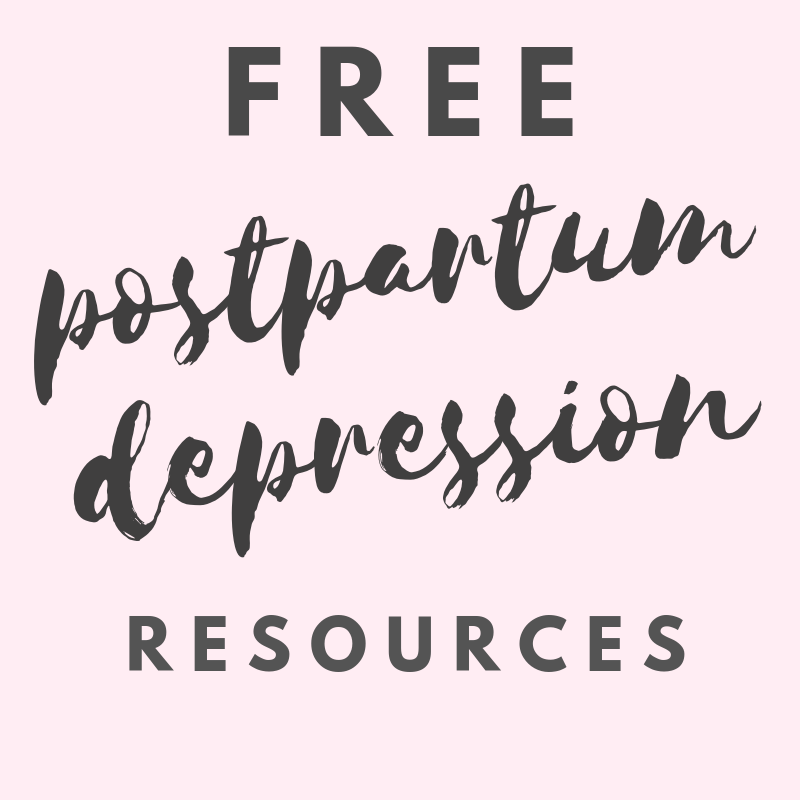 Postpartum depression can cause women to experience thoughts of running away, jumping out of a moving car or falling asleep and never waking up again. Intrusive thoughts often make a woman believe she is unfit to be a mother and that her children would be better off without her. Some intrusive thoughts are inappropriate and violent. Many can be sexual in nature or include things like harming animals or setting the house on fire. Basically, any thought or image that enters your head and feels scary and unnatural is an unwanted or intrusive thought. Thoughts and images alone are not dangerous. But intrusive thoughts can cause several unwanted side effects that can become dangerous both physically and mentally. Obsessive Compulsive Disorder. Intrusive thoughts can cause a woman to develop postpartum OCD and become obsessed with certain thoughts and images. If she imagines the baby dying in their sleep, she may stop sleeping in order to check on baby several times through the night. Stress and Anxiety. Knowing that intrusive thoughts are a possibility is a big source of stress and anxiety, which can worsen symptoms of postpartum depression. For a woman suffering from postpartum anxiety, scary thoughts can cause panic attacks and other symptoms. Acting on Intrusive Thoughts. It’s rare that a woman would go so far as to act on her intrusive thoughts but the danger that she might still exists. Intrusive thoughts can even lead a woman to feel suicidal. Stigmatizing. Intrusive thoughts play a major role in the stigma of postpartum depression. Many mothers who try to open up about them are treated like crazy people or seen as dangerous and suicidal. If intrusive thoughts are confessed to a person (even a medical professional) without enough knowledge about them, the consequences could be dangerous. Its important to find a safe place to discuss intrusive thoughts. The truth is, they are not real. They may stem from the feelings of inadequacy or overwhelm caused by postpartum depression but they are not part of the subconscious mind. They are a figment of your imagination and a by-product of mental illness. In order to eliminate them, and avoid having them control your life, you need to accept that they are coming from somewhere else, and not from what’s within your heart. As long as a woman is suffering from a mental illness, the intrusive thoughts will always be a possibility. So the only way to eliminate them altogether is to treat the underlying condition. There are still several things a person can do to keep intrusive thoughts from affecting their lives. Document Them. Writing down scary thoughts as they happen can help make them less frightening. You can write them on paper, in a journal or workbook, on your phone or use an app. If you really want to take a stand against intrusive thoughts and connect with other women who are having them, you could even consider blogging about them. Release Them. Intrusive thoughts are perhaps one of the hardest things to speak out loud when battling postpartum depression. Many people are not nearly as informed about intrusive thoughts as they should be, and this makes talking openly about them risky. The best place to express the scary thoughts you’re having is to find a safe and positive space, such as a support group. The Postpartum Stress Center offers a safe place online for women to anonymously #SpeaktheSecret. It helps to read some of the thoughts other women have had, and even submit your own to release them from your mind. Online Therapy. Speaking to a mental health professional is always a good course of action for women battling intrusive thoughts. With online therapy, you have the option to chat with your therapist anytime throughout the day, as opposed to waiting for a scheduled appointment. This is a great option to be able to discuss scary thoughts as they occur. (If this is an option you’d like to explore, try online therapy using my affiliate link: http://runningintriangles.com/OnlineTherapy). Meditation. Clearing the mind on a daily basis can help reduce the instances of intrusive thoughts. Meditation can also help to create mindfulness in general, making you feel a little bit more in control of the thoughts and images in your own head. Meditation, either alone or while doing yoga, should become an important part of your self-care routine for battling postpartum depression and intrusive thoughts. Positive Imagery. Surround yourself with sights that make you feel happy. You can put together a photo album of some of your happiest photos and look at it regularly. Or keep flowers and plants in your home. Hang motivational posters or family photos on the walls. Subconsciously, your mind will soak up all the beauty around you and be a happier place. Get Enough Sleep. Sleep deprivation is known for causing all kinds of problems in new mothers. From postpartum depression to anxiety and rage, a lack of sleep is like leaving the door wide open for intrusive thoughts. If you need to, invest in a better mattress and look into other ways to fight off insomnia. Distraction. Keeping the mind distracted will allow less time for scary thoughts to creep in. Music is an excellent way to keep the mind distracted. Try playing music in the background while you’re home, call or visit with a friend, read a book or put on the television. Maintaining a proper self-care routine can also help keep intrusive thoughts away. The most important factor in dealing with intrusive thoughts is to know the difference between your actual thoughts and the unwanted ones. Having intrusive thoughts may make you feel like a bad mother with the potential to do something harmful but it’s not the truth. Focus on the positive thoughts and try your best to ignore the ones that make you feel anything but joy. Accept that they are a side effect of postpartum depression and not who you have become. It may take a while for the thoughts and images to go away, but as long as you remember that you are still you inside, you can defeat them.